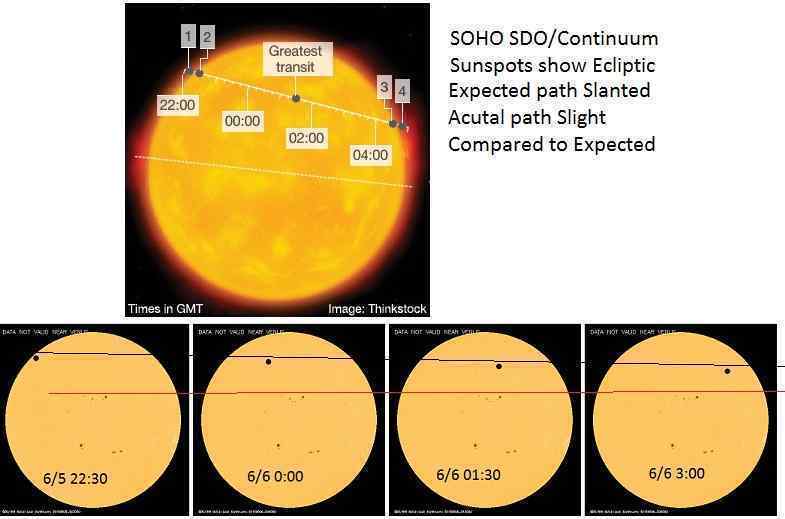 Last week we reported that the path of the Venus transit did not go as expected, but rather paralleled the Ecliptic. The orbit of Venus was expected to drop from upper left to lower right during the transit, as Venus normally has a tilted orbit swooping above and below the Ecliptic. Note the Ecliptic, the Sun’s middle or waist, is created by the Sun’s rotation. The planets are slung out around the Sun, all orbiting the Sun in a counterclockwise manner around the Ecliptic, following the Sun’s rotation and the particle flows it emits, the sweeping arms of the Sun. 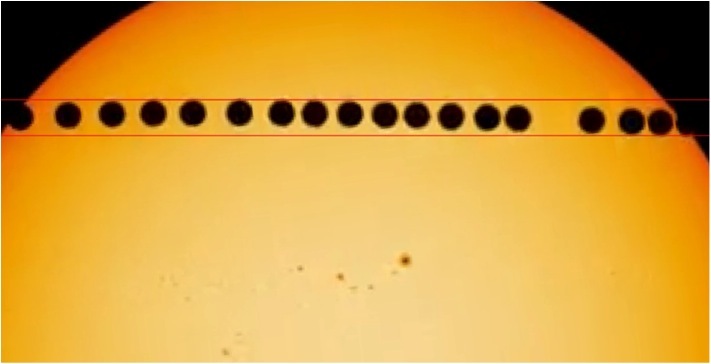 One can determine the line of the Ecliptic on images by plotting the sunspots on the face of the Sun. 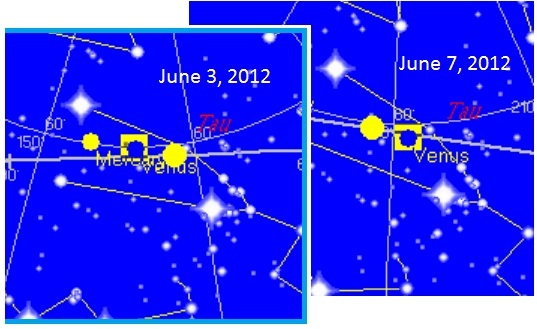 The path of Venus during the June 5-6, 2012 transit was not sharply slanted as expected, but only slightly slanted. Most dramatic, and instantly noted, was that the path was aberrant, not slanted as expected. But during time lapse animations made from many sources, it became evident that a second aberration had occurred – Venus was wobbling! The wobble can be most distinctly plotted on SDO images, as they show only sunspots and the transiting Venus. These images are taken from the Solar Dynamics Observatory (SDO) which is in a fixed, static, “circular geosynchronous orbit” positioned close to the Earth and directly between the Earth and the Sun - the LaGrange L1 spot. It does not bobble up and down several times over a 6 hour period, nor could it achieve the distance needed to create a bobble in Venus in the images. The Sun is not bobbling in the images, nor should Venus. And during the Mercury transit, no wobbling occurred. Only Venus, caught in the cup and reacting to the close presence of Planet X, is doing so. After launch, the spacecraft was placed into an orbit around the Earth with an initial perigee of about 2,500 kilometres (1,600 mi). SDO then underwent a series of orbit-raising maneuvers which adjusted its orbit until the spacecraft reached its planned circular, geosynchronous orbit at an altitude of 36,000 kilometres (22,000 mi), at 102° W longitude, inclined at 28.5°. A satellite in a circular geosynchronous orbit directly over the equator (eccentricity and inclination at zero) will have a geostationary orbit that does not move at all relative to the ground. It is always directly over the same place on the Earth’s surface. … The first Lagrange point is located between the Earth and the Sun, giving satellites at this point a constant view of the Sun. The Solar and Heliospheric Observatory (SOHO), a NASA and European Space Agency satellite tasked to monitor the Sun, orbits the first Lagrange point, about 1.5 million kilometers away from Earth. The wobble plotted above on SDO images showed up distinctly on a NASA Explorer video, using their own SDO images. NASA placed this time lapse video into the public domain. The wobble pattern is also discernible on images taken by the SOHO satellite. SOHO also orbits the La Grange L1 point in a tiny circle once every six months. Neither SDO nor the SOHO satellite move with the speed or distance or in the direction that would cause the observed wobble. SOHO is one of three spacecraft currently in the vicinity of the Earth-Sun L1 point. SOHO is distinguished by being the first three-axis-stabilized spacecraft to use its reaction wheels as a kind of virtual gyroscope.The SOHO spacecraft is in a halo orbit around the Sun-Earth L1 point, the point between the Earth and the Sun where the balance of the (larger) Sun's gravity and the (smaller) Earth's gravity is equal to the centripetal force needed for an object to have the same orbital period in its orbit around the Sun as the Earth, with the result that the object will stay in that relative position. It orbits L1 once every six months, while L1 itself orbits the sun every 12 months as it is coupled with the motion of the Earth. This keeps SOHO at a good position for communication with Earth at all times. The establishment, via their army of paid debunkers, immediately made claims that the Proba-2 satellite created the bobble. Proba-2 is a European Space Agency satellite which has an orbit around the Earth, so moves. But this is not the issue! The images showing the wobble are from NASA satellites - SDO and SOHO – not the Proba-2 satellite. And in any case, the orbit of the Proba-2 would hardly create an up and down bobble in Venus either! ESA’s Proba-2 microsatellite, in low-Earth orbit, tracked Venus across the solar disc for nearly seven hours. Venus appears to wobble thanks to the slight up-down motion of Proba-2 and the large distance between the satellite and the Sun. I thought I would make an explanation of the video before a conspiracy takes form. The Zetas have explained that Venus is caught "in the cup" with Earth and the Dark Twin. As such, it is squeezed close to Planet X, which is looming at the right, coming at Venus and the Earth in its retrograde sling orbit. The cup is formed by particle flows that come round behind Planet X and flow to either side, forming pincer-like arms that prevent the three sisters planets – Venus, Earth, and the Dark Twin - from moving along in their orbits or escaping the cup. ZetaTalk Explanation 6/6/2012: Venus is caught in the cup, as we so long ago explained. This occurred because as Planet X passes the Sun it does so within the region of the orbits of Earth, Venus, and the Dark Twin. Planet X first crossed Earth’s orbit in December, 2003 when the Earth encountered Planet X, halted her orbit due to this massive presence, and has subsequently been pushed back in her orbit by the retrograde motion of Planet X to what would normally be Earth’s August position. As Venus and the Dark Twin came round in their orbits, they encountered this same obstacle and also halted. Venus has been moved back and forth in the cup, in order to simulate its normal orbit for Earthlings, in accordance with the Element of Doubt rule imposed to reduce panic in the trigger-happy establishment. Human beings throughout history have practiced cannibalism or ritualistic eating of the dead. This involves eating other people after they are already dead. Cannibalism was widespread in the past among humans in many parts of the world, continuing into the 19th century in some isolated South Pacific cultures, and to the present day in parts of tropical Africa. Cannibalism has been well documented around the world, from Fiji to the Amazon Basin to the Congo to Maori New Zealand. Today, the Korowai are one of very few tribes still believed to eat human flesh as a cultural practice. It is also still known to be practiced as a ritual and in war in various Melanesian tribes. What made the Miami Zombie attack newsworthy was that the victim was being consumed while alive. The “zombie” was known to be religious, carrying around a Bible, reportedly even on that day. The victim was smaller, older, and less muscular than the “zombie”. The attack was so gruesome that the CDC felt it necessary to make a public announcement that no virus (the stuff of horror movies) was involved. A photo of the victim’s face, taken at the hospital, shows that the “zombie” was well on his way to consuming the victims entire face – nose, eyes, and cheeks. Authorities say he may have been under the influence of “bath salts”, which is a drug referred to as the new LSD. This horrible attack happened Saturday and was caught on surveillance. The footage is tough to see because there’s a bridge blocking it, but you won’t want to see the real thing after looking at the pictures below. A witness described Eugene ripping at Poppo’s face with his mouth and growling at a Miami police officer who ordered him to get off the homeless man. The officer then shot and killed Eugene. Eugene’s girlfriend said she believes he was drugged unknowingly. The only other explanation, she said, was supernatural, that someone put a Vodou curse on him. The girlfriend, who unlike Eugene is not Haitian, said she has never believed in Vodou, until now. The CDC formally denied that a zombie apocalypse might be underway in the U.S. CDC does not know of a virus or condition that would reanimate the dead (or one that would present zombie-like symptoms). Per the Zeta’s, this was a genuine case of possession, with the “zombie” willingly giving his body over to a highly Service-to-Self entity. ZetaTalk Explanation 6/2/2012: We have described the rash of school and mall shootings as being in essence an application for a position on the Prison Planets that will be the home of highly Service-to-Self souls during their next incarnation. And we have described some horrific acts such as a mother eating her newborn baby as an act done during possession - a Service-to-Self soul in the mother giving the body to another more vicious Service-to-Self soul, temporarily. Though the Miami zombie incident was certainly fueled by drugs, others in the grip of such a delirium did not become cannibals. What one does during a psychosis, under the influence of a delusion, is a choice. Even if feeling threatened, due to a delusion, one would not chew a prone man’s face off, particularly with the victim being smaller and older than the attacker. What emerged was incited by something other than a delusion or fear. Starvation is on the increase around the world, though the establishment keeps this out of the media. It is one thing to envision eating the dead, as does happen during starvation, but eating someone while they are still alive is unthinkable. And where chewing on an arm or leg would bring nightmares, chewing off the face of another person, while they are alive, including eating the eyes and chewing off the nose, is a vision that only the Service-to-Self would want survivors of the coming Pole Shift to have on their minds. Fear drives one in the direction of being Service-to-Self, and they hope to reap a good harvest for their prison planets. This was another case of possession, with the attacker, Eugene, encouraged to take the drugs that would create a fearless attack. Both Eugene and the spirit taking charge during the possession knew that death might result, so in essence this was an application for a Prison Planet position also. Will there be more such instances? Not every Service-to-Self person is willing to live with the potential consequences of such a drama, in prison on Earth where they would be subject to control by others. The possessing soul can leave, but the original soul must stick with the body until death. Possession thus requires that the incarnated soul cooperate and want the outcome. Few in the Service-to-Self are willing to take that risk. What happens when the charged tail of Planet X wafts the Earth? The world had a glimpse of this on June 6-7, 2012. Continuous lightning storms and monumental hail assaulted Colorado. 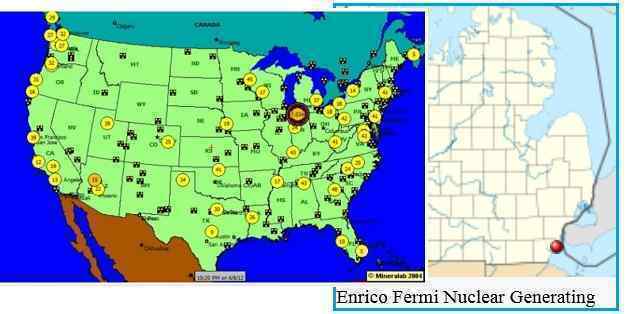 The expanding Seaway near the Fermi 2 nuclear power station had continuous booming from breaking rock and a subsequent false alarm when a radiation detector malfunctioned. And in the Middle East a combination of a magnetic spiral in the sky and ground fires from fractured ground created speculation in the media that a UFO was responsible. On the night of June 6th in Denver Metro Area of Colorado, there was a huge amount of lightning, hail, etc. happening with all kinds of warnings, for flash floods, tornadoes, etc. What really threw me for a loop was the lightning. These lines (which are many miles high) and spaces between the lines are all going on and off exactly in unison, and at about one- second intervals non-stop for at least 20 minutes or more that I observed it - and it looked like a machine was doing it. It did not seem natural or real at all in it appearance, timing, or in what it made my body feel like. I got lost on a road I have driven thousands of times before in the last 19 years, which is basically a straight shot to my house. 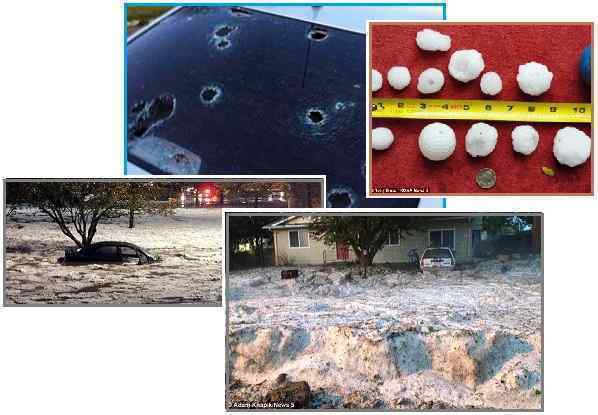 These amazing pictures show the devastation caused by massive hail storms which have swept through Colorado and Wyoming this week. Destructive hailstones coated the ground so thickly that the landscape appeared to be covered in snow. The hail downpour was part of a powerful storm system that rolled through parts of Colorado and Wyoming on [June 7], packing heavy rains, high winds and hail. According to RadNet, the United States’ radiation monitoring network, South Bend, Indiana experienced extremely high levels of radiation last night [June 7] — up to 100 times higher than safe levels. UPDATE: RadNet issued the following statement this morning: The alert level reading last evening appears to be a false alert from an equipment malfunction. Those on the ground report that the explosions are ‘loud and deep’, sounding like fireworks with a kick. The explosions are oftentimes followed up with a squadron of helicopters or other aircraft, oftentimes black and unmarked. These explosions are seriously consistent, loud booms. Thousands of comments on articles, discussion boards, and twitter posts are surfacing regarding this event. Explosions are still reportedly being heard in rapid secession, often a large number over the course of only a few seconds. There has been strange phenomenon in northern Iraq that people are amazed. It happened the evening of 7-06-2012. You could see the fireball in several places, about 100 km east of Erbil. A huge fireballs that has never happened before. It looked long from which a spiral. People could smell something strange smell and it lasted for approximately two hours. I hope you come up with an explanation for this phenomena. The place is situated in a mountainous area. What are these gas that burns in the air. 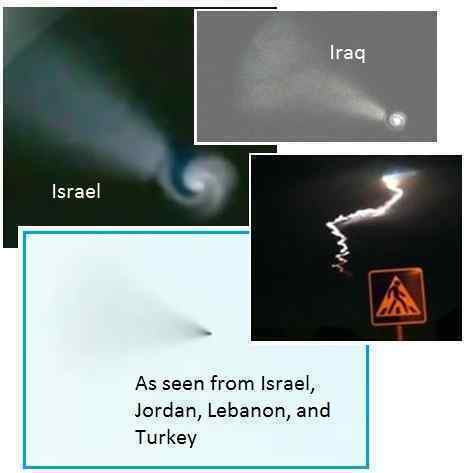 A mysterious swirling spiral of light seen in the skies over Lebanon, Syria and Jordan late [June 7} sparked a flood of speculation over the nature of the nighttime event, including that it may have been a UFO sighting. The trail of light was also reported in Armenia, Turkey and Cyprus. The Voice of Russia radio station’s website reported Friday that Russia had conducted a successful test of the Topol Intercontinental ballistic missile from the firing ground at Kapustin Yar in Astrakhan, south Russia. ZetaTalk Explanation 6/16/2012: On the night of June 6 the public was shocked by a lightning storm in Colorado, booms and an apparent radiation leak at the Fermi 2 plant along the St. Lawrence Seaway, and a magnetic spiral accompanied by methane or gas flares in the Middle East. This is no coincidence, as a waft of the magnetically charged tail of Planet X created a lurch in the Earth wobble, causing plate movement, and magnetic displays in the atmosphere. Where the Earth wobble is caused by a conflict between the Earth’s magnetic N Pole and the N Pole of Planet X, this creates a relatively gradual push during the daily wobble over the course of an hour or more. Getting slapped by the highly charged tail of Planet X snapped the magnetic N Pole of Earth away, creating sudden plate movements. The Seaway of course has been steadily spreading apart, with booms in Wisconsin the latest piece of evidence. Other than a break in some monitoring equipment and the resultant heightened alerts, there was no harm done to the Fermi 2 plant in Indiana. But in Iraq, where the turning of the Arabian Plate is causing the pointed tip of the plate to grind through the oil fields, this jolt released trapped gasses, causing fires and smoke trails visible in the night sky. Excuses offered by the establishment, that there was a nuclear exercise near Fermi 2 and that a Russian Rocket several countries to the east of the spiral were responsible for all this is to be expected. What caused the massive and dramatic lightning display over Denver and the spiral in the sky seen and filmed widely from Northern Iraq to Turkey to Israel? Lighting is intrinsically caused by differences in the electro-magnetic charge in various air masses, as are spirals. Are such wafts of the tail to repeat and become common? We have warned the establishment that the cover-up would not hold, but would rather be taken down by various displays arranged by the Council of Worlds. This demonstration is but a hint of what could be arranged if they do not comply with the demands of the Council. Mankind, the common man, deserves to know what they are dealing with, in order to confront the spiritual lessons before them.